I am no supporter of embattled BC Liberal MLA Kash Heed. The former solicitor general and MLA for Vancouver-Fraserview is an embarrassment to BC politics, not just to his own party. His egotistical comments about his great abilities are too much even for a politician. But I feel compelled to offer Heed some defence in the current feeding frenzy of columnists, reporters and political commentators over his going to the courts to try and avoid an order from Elections BC to file an updated financial disclosure for his controversial May 2009 election win. 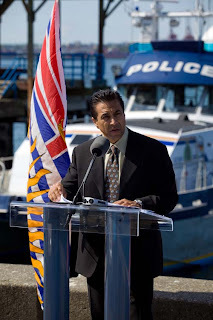 The BC Liberal Party has a lot of tough questions to answer about its role in the May 2009 Kash Heed election campaign – like what the hell have they been doing all this time while the scandal developed? And why did longtime BC Liberal Party Executive Director Kelly Reichert suddenly resign last December? What steps did Reichert take to help resolve this issue? Did he appoint Heed's campaign team members, including those now facing charges? Heed could lose his seat according to a letter from Elections BC Acting Chief Electoral Officer Craig James sent December 2, 2010. “Should you fail to comply with the provisions of the [Election] Act . . . I will feel compelled to forthwith present a report to the Speaker informing him that you have ceased to hold office and that your seat has thereby become vacant,” James wrote. Heed responded by filing a petition in BC Supreme Court – discovered and released by the BC New Democrats – asking that James’ order be dismissed. “I did not prepare the initial or amended Election Financing Report and at the present time I have no reason to believe the Election Financing Report is inaccurate,” Heed states, blaming his former financial agent Satpal Johl for any problems. Johl and Heed’s campaign manager Barinder Sall both face Election Act violations, with Sall also facing criminal charges over allegations they were involved in distributing a vicious and false anti-NDP leaflet in the riding that was paid for but never declared by the Heed campaign in its financial disclosures. And last week an RCMP search warrant “Information To Obtain” document showed that Heed himself may yet face charges of breach of trust and other offences related to that campaign. But Heed’s argument in the affidavit makes some sense. “Since I am unable to compel Mr. Johl to file a supplementary report and I personally have no information on which to base a supplementary report … I am seeking to be relieved of this responsibility,” he added. 3) Heed cannot get the assistance of the BC Liberal Party to file the new disclosure requested by Elections BC. If the above three points are accurate, then what choice is left to Kash Heed but to appeal to the court? Should he be contacting two men charged with offences directly related to the impugned campaign and ask them to help him out? When he himself is under investigation? Not bloody likely a good plan! The real issue is why the BC Liberal Party has not stepped in to clean up the mess. Make no mistake – political parties of every stripe have had past problems with Financial Agents who can't – or won't – do their job during or after an election. It just happens. That’s when the party has to intervene and resolve any outstanding issues, not the individual candidate. And don’t believe the bravado of some current MLAs saying Heed should have known better – I would be amazed if most MLAs have a thorough understanding of the reporting requirements – thorough enough to be able to step in if their own financial agent disappeared and without considerable party assistance. Interim NDP Leader Dawn Black did exactly the right thing yesterday in releasing the Kash Heed court documents – call on Heed and the BC Liberals to file the disclosure as demanded by Elections BC. But Heed has the right to argue in court that he personally can’t supply that information. And if it’s true – or at least highly believable to a judge – expect Heed to avoid being thrown out of office. But that won’t solve his other problems – and it certainly won’t let the BC Liberal Party off the hook whatsoever. As I said, Heed is an embarrassment to BC politics – but due process is due process – it should be followed before there’s any public hanging.